Thanksgiving is on the horizon and personally, I can’t wait! It is a special time of being with family, giving thanks, and of course good food! Why not give this year’s celebrations a healthy twist? And, I am not talking about giving up flavors! Spice up your holiday with the exotic deliciously healthy tastes of New Zealand! You may be asking “how in the heck do I do that?” We’ve got you covered! New Zealand Multiflora Honey is fabulous to baste your turkey! It creates a golden brown juicy turkey to die for! Then, amp up the rest of the dishes by adding their fabulous pure Pacific Sea Salt on the veggies and add a little Chipotle BBQ salt or Mesquite Smoked Pacific Sea Salt to the stuffing and the fixin’s! After you are full of your turkey dinner, enjoy Manuka Honey Caramels and Chocolates as a sweet after dinner treat! Oh, my! Your taste buds are in for a treat! As a Pacific Resources International (PRI) ambassador, I’m excited to tell you that I have a great discount that you can use to try out a few of the amazing PRI products yourself! Right now, you can get 15% off and FREE shipping! To shop, go to shoppri.com and use discount code: Feast15 at checkout. But first, I can’t wait to tell you about all the wonderful items I got to try out this month! Pacific Resources International is an exclusive importer of various New Zealand Manuka Honey, health and beauty care products. Their award winning products include Manuka Honey, Pacific Sea Salt, Propolis Lozenges, Proper Crisps Chips, Manuka Caramels, and Manuka Honey Health and Beauty Products! 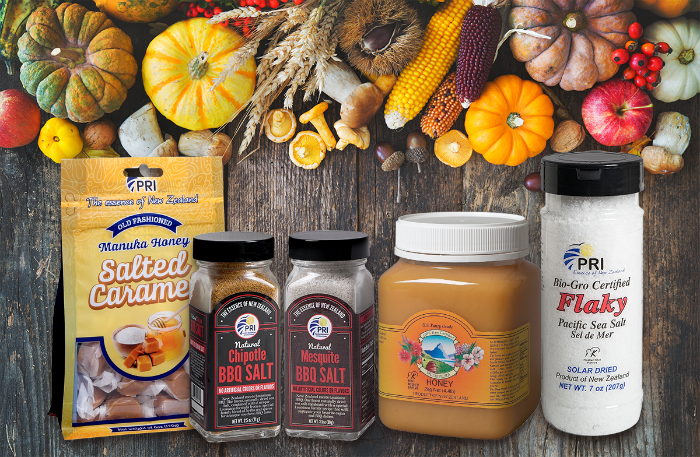 Season your Thanksgiving Feast with these delicious products! Are you ready to check out them out? New Zealand’s Multiflora Honey is a distinctive blend of pure, GM Free honeys sourced from New Zealand’s clean and green forests and pastures. It is processed using state-of-the-art equipment and their world-renowned “creamed” honey technique to create a honey with a beautifully smooth texture that is easy to spread. You will love this fabulous honey, which is cool processed (raw) to retain all its natural properties. In addition, it is certified Kosher. If you are a lover of Cajun and/or BBQ dishes, you will love the delicious Mesquite Smoked Pacific Sea Salt. The Pacific Sea Salt is combined with the secret Louisiana family smoked Mesquite process to captivate your favorite Cajun, BBQ dishes. You can give a special twist to a salad, scrambled eggs, and more! PRI’s Mesquite Smoked Pacific Sea Salt Fine shaker is harvested from the great southern oceans that sweep through Cook Strait between New Zealand’s North and South Islands into the solar field. The waters are evaporated using the natural drying process of the sun and wind for 13-22 months. This method produces the essential trace element blend need for a healthy body. So, not only is it delicious, it is also good for you! Do you prefer a smoky BBQ flavor? If you do, then the yummy Chipotle BBQ Smoked Pacific Sea Salt is for you! It is PRI’s finest, naturally dried sea salt combined with a unique Louisiana formula from a special family blend of herbs and spices for a unique southern BBQ taste. Pacific Sea Salt is harvested from the clean oceans that sweep through Cook Strait between New Zealand’s North and South Islands into the solar field. Be the king, or queen, of BBQ with this fabulous addition! As someone that cooks quite a bit, I love the Flaky Sea Salt! The Marlborough Flaky Sea Salt is evaporated by an age-old process producing unique ﬂake shaped crystals. These are prized by the Epicurean palate for their ﬂavor, soft texture and versatility when used in fine cuisine. The Organic Flaky Sea Salt has a unique three-dimensional crystal. Which is produced by being very slowly evaporated in an open pan. It is a very light textured salt with a delicate ﬂavor. The taste is created by the unique crystal size and shape of the Marlborough sea salt flakes. This Flaky Salt is excellent for sprinkling on top of foods and its light texture means it “sticks” better. It is also perfect for garnsihing salads, vegetables, BBQ’d meats and even French-fries! Who doesn’t love delicious smooth caramels? I know, right?! PRI’s mouth-watering delicious Salted Manuka Honey Caramels are perfect for after dinner or an anytime treat! Soft chewy caramel is mixed with New Zealand Organic Flaky Sea Salt to bring out that delicious Manuka Flavor! These delicious caramels are produced right here in the USA. I am also a fan of the delicious Mint and Ginger Manuka Honey Chocolates! These tasty treats are made by wrapping rich dark chocolate around the finest New Zealand Manuka Honey and adding a touch of mint or ginger. PRI’s Manuka Honey Dark Chocolates contain only 3 Ingredients: Pure Manuka Honey tested 5+, Dark Chocolate (99% Cocoa), and Mint or Ginger oil. You will be delighted to know they are all natural, gluten free, dairy free and kosher. You don’t have to worry about any of the “nasties”! They have NO artificial colors, flavors, or preservatives. And, again, these yummy treats are produced right here in the USA. Ready to try these amazing products for yourself? Head on over to shoppri.com to shop and remember to use discount code: Feast15 at checkout to receive 15% off your order and FREE shipping! These all sound so good. Can’t wait to try them. The honey caramels sound so good! This would make the holidays even sweeter. Chocolates, caramels and honey, oh, my! These would be so tasty. There products are so good had some at a friends especially the honey so good and good for you too. I’d love to try those BBQ sea salts on some burgers or ribs. That would be good. I would love to try the Chipotle BBQ Smoked Pacific Sea Salt, sounds good! I have not tried this brand but their products look great! The Salted Manuka Honey Caramels sound amazing. I would love to try the honey caramels! It’s past Thanksgiving but I know I would use these for every day seasoning or a special Sunday dinner! Hope to find out what the buzz is all about. We love honey. Honey is so beneficial for your health. We use everyday. Ingest and topical too. The Salted Manuka Honey Caramels sound delicious! I would love to try these out. My family loves Manuka honey, and I love flakey sea salt. I haven’t tried this brand, but I believe I will very soon! They all sound amazing. I’m super excited to try these. They sound amazing and I’m always looking for new spices. I haven’t tried caramel or chocolate with manuka honey. I bet they’d be good. I’ve actually been using Manuka honey and reallylike it. ;it helps my gut issues. I have been using the Manuka honey in my tea for the last year and it has a lovely flavor to it. We just put in an order for two hives for my parents property. Christmas gift…local bees. I bet those salted caramels are too good for words. I want to try those. I didn’t know PRI was the first company to bring Manuka honey to this country. That’s interesting. Ihave had their products before and they are really good. And the Simply Manuku Hand Cream works like magic. I love how Manuka honey has helped my gut problems. These honey products would be great to try. I think it would be interesting to try their Manuka honey beauty products, too. I bet they’re good stuff. I have used the chipotle sea salt as a flavoring for chicken and it is delicious. I bet those chips they have are great tasting, too. I need to give those a try. It’s interesting that the sea salt is organic. I like using organics whenever possible. I’m impressed by PRI products. They seem to have a variety of healthy and tasty foods, etc. I would love to try the honey chocolates. They would be great for a treat. I have a brownie recipe that uses flaky salt as a finish, so I’d like to try that. I have had Manuka honey, and it is great! SO many interesting seasonings, and we use lots of honey too. I bet those BBQ and chipotle salts would be good on grilled meats. Yum! I started using manuka honey for stomach problems and was impressed with it. I haven’t tried it in caramels. Hope to experience the difference myself. I’ve heard good things about PRI products. These look great. I bet those salted caramels are really good. I’d eat all of those, lol. Healthy and delicious! So many wonderful products, and the honey is the best. 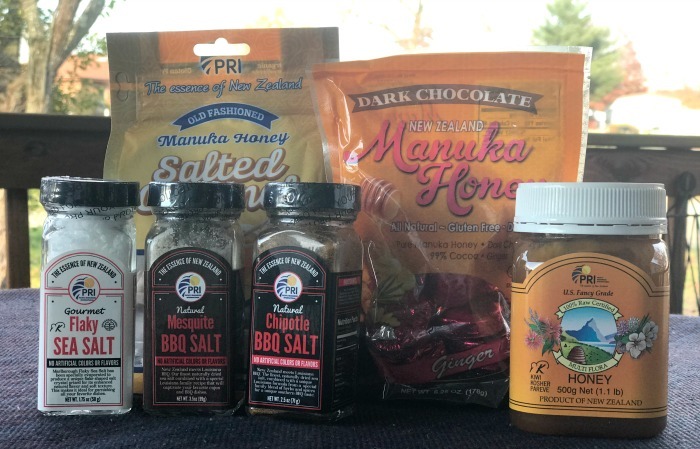 Manuka Honey PRI has lots of yummy produDcts. Their hand cream is awesome also! I love using Manuka honey. It’s great for any stomach problems. I know I like Manuka Honey. I’d love to try the sea salt, too. I bet it’s great in dishes. All these sound great. I would love to try their Salted Manuka Honey Caramels. yum. I love the honey and caramels. I loVe natural products. I have tried PRI products and they are great. Super high quality and great flavor. I have used both their chipotle and mesquite salt to flavor chicken so think it would be excellent for turkey as well. I have used the smoked salt, and look forward to trying the honey soon. I love trying new seasonings and found that I can increase my vegetable intake by creative seasoning. Love the seasonings and the honey sounds great. I use Manuka honey for my stomach problems and I like it. I’ve never tried it in caramels or chocolates but those look great. (Season Your Thanksgiving Feast with #ManukaHealth #ShopPRI) I am amazed at all the different products that they have on their site. I would really like to have some of that great sounding honey.